Working with our MD medical students is just one of the many aspects of our job. The Communications Team at the John A. Burns School of Medicine shares news about our school in a variety of ways. Find the latest headlines, videos and photos on our special news website, UH Med Now. Connect with us by clicking on any of the social media icons at the foot of our webpages. We also issue a weekly eNewsletter and an annual “Dean’s Report” summarizing news of the year. Working news media should contact the Office of Media, Communications and Government Affairs for additional information about our school, breaking news, or high-resolution video files for broadcast. Tina Shelton, Director of the office, directs both internal and external communications at the medical school, and assists news media with inquiries involving the medical school or its faculty, staff and students. Tina also produces videos, photographs, news releases and news stories for the UH Med Now news blog and other parts of our website. She directs multiple social media outlets for the Dean’s Office, and produces both internal and community/alumni eNewsletters. Tina also serves as Legislative and Government Affairs Coordinator for JABSOM. 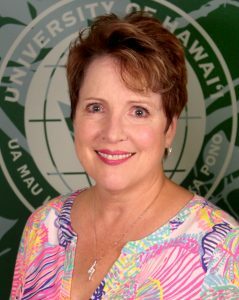 A graduate in Journalism at the University of Hawaiʻi at Mānoa (and the Kapiʻolani Community College), and was named a “Distinguished Alumna of the University of Hawaiʻi”. Tina was an award-winning news reporter and TV news anchorwoman for three decades covering the people of Hawaiʻi. Deborah Manog Dimaya is multimedia journalist for UH Med Now. In addition to producing original content (articles, video and photos) for the JABSOM news site, she also assists with news media requests and video news releases. She graduated from the University of Hawaiʻi at Mānoa with both a BA in Journalism and a BA in Ilokano Language & Literature. She was a freelance reporter and videographer for the Honolulu Star-Advertiser and has been published in several other local publications. Collaborating with the JABSOM Communications Team is Vina Cristobal, Communications and Marketing Coordinator for the University Health Partners of Hawaiʻi (UHP), the JABSOM faculty practice plan. She creates visual content for the UHP Hawaiʻi (and JABSOM) websites and social media networks, and is a talented videographer and video editor. Vina graduated from Honolulu’s Chaminade University, majoring in Communications. For inquires about scheduled or proposed events at JABSOM-Kakaʻako, or to schedule a group tour of our facilities CLICK HERE to contact JABSOM Special Events Manager, Melia Young or her dynamic partner TC Chun. To get an event listed on the e-Bulletin Board in the Medical Education Building lobby at Kakaʻako, read: e-Bulletin Board.